The sheep industry must follow the consumer trend towards healthy eating by delivering lambs with lower fat scores. James Smyth, procurement manager for Irish Country Meats, says that buyers are increasingly posing questions about origin and carbon footprint rather than price. “People are more conscious of the level of fat they are consuming,” he told last week’s Teagasc Hill Sheep conference, adding that while the Irish and UK markets still want a nice level of fat cover at 3, French, Swiss and Nordic buyers want lighter carcasses. “That is where the industry is going, very health-conscious, and we have to follow that. Mr Smyth said with the growth in healthy eating, there are also strong opportunities in the organic market. “We have invested heavily in this area and see good opportunities in it,” he said. The value of sheep protein to the Irish economy grew 15pc last year to €315m, with 70pc of lamb exported. “It is a real challenge to keep that momentum going, it is a substantial increase year on year,” said Mr Smyth. For processors, the quality assurance scheme and a consistent year-round throughput of product were key to securing their markets. Work is continuing to access the China marketplace but it is “slow”, said Mr Smyth. “We are looking forward to serving that market, it probably won’t be the high-value products but nonetheless there are ample opportunities there,” he said, particularly for forequarter meat. Markets such as Belgium, Germany and Sweden now account for 29pc of Irish sheepmeat exports, reducing the reliance on the UK and France. However, Mr Smyth acknowledged that there was some negativity in the marketplace, with a 14pc decrease in the export tonnage going to the UK, and a 15pc fall-off in France. He said the level of nationalistic sentiment and labelling laws in France was a worry. “In years past when the labelling laws weren’t quite as stringent they would have been procuring lambs from the UK and Ireland. “Now it tends to be French plus one other, and it has tended to be the UK. Whether that changes in the weeks and months ahead, we’ll have to see,” he said, adding that sheepmeat consumption in France has declined by 5-6pc every year over the last five years. He pointed out that the market in Germany has been strong, including for organic produce. Switzerland is also a purchaser of the light hill carcass lambs. “It is an expensive protein and in many ways it is a niche product, a treat really and is perceived as quite expensive,” he cautioned. Overall prices were up substantially last year at around €5.04/kg, a 27c/kg increase on 2017. Hogget prices reached a five-year high of €5.58/kg in 2018. “We have and will endeavour to get a good price for these store feeders and get them back into the marketplace for good quality store feeders,” continued Mr Smyth. He said February was proving a difficult month for the trade, but from mid-March slaughtering would begin for Easter, followed by Ramadan a fortnight later. The ideal market lamb for a Grade A was 18-20kg, with a fat score at a decent level. However, Mr Smyth stressed that the plain lamb was at the opposite end of the scale and there is “no profit” for anyone in marketing at this fat score. “The closer we can get to 20kg the better – it is more flexible, more marketable and more profitable,” he added. Farmers need to deliver consistency in terms of the size of cuts and taste. “The quality of the lighter lambs coming through the system are much better,” he said. “We would say spare a thought for the fat score and market the lambs in an orderly fashion. “We are gone from a situation where we used to debone 25pc, now it is 75-80pc. “In the future we will even go as far as 90pc further processed. Mr Smyth added that this was good for employment and the whole carcass market was now a “thing of the past”. Marketing lambs under specific brands designed to appeal to consumers can yield benefits for hill sheep farmers. 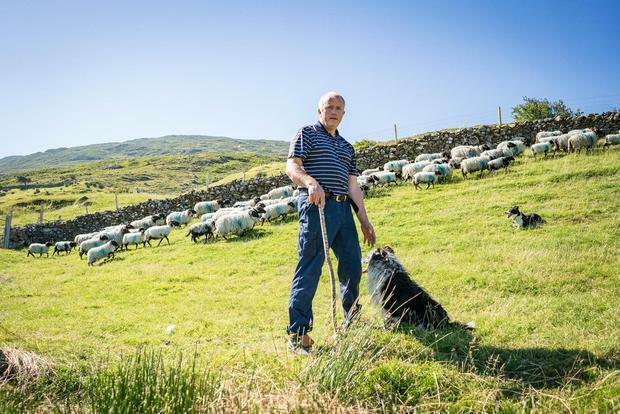 Brendan Joyce, vice president of the INHFA, who farms on the hills around Maam Cross in Connemara, is part of a producer group that has seen farmers come together to market their lamb under the Atlantic Hill Lamb brand. “We came together to see what could be done for it,” he told the Teagasc Hill Sheep farming conference. It was out of those discussions with Kepak and Bord Bia that the Atlantic Hill Lamb brand was born. Ram lambs that were previously sold as stores off the hills are now delivered to Kepak. “It involves having those lambs with a carcase weight of 10kg-15kg with a minimum fat score and carcase confirmation of O2 or better,” said Mr Joyce. The lambs have required some supplemental feeding, based on research from Teagasc, to reach these specifications. “This market is in its early stages yet, but is certainly showing promise and farmers are enthusiastic at delivering a high-quality product to the marketplace,” he said. Since last July over 16,000 lambs have been marketed directly to the factory through the Atlantic Hill Lamb producer group. Mr Joyce said hill farmers are among the most productive in the country. “I hope I’ll pass on the knowledge to the next generation and hopefully there is a livelihood in it for them,” he said. He stressed that one of their greatest challenges was the alignment of policies between what the National Parks and Wildlife Service see as good environmental practice and what the Department of Agriculture view as good agricultural practice. Often it can mean a place is considered to be in a “good agricultural state”, but the environmental side might not agree. “They (the authorities) need to be able to give clear information to farmers. We have to leverage what we have in some of the finest pristine environments in Europe,” Mr Joyce added.